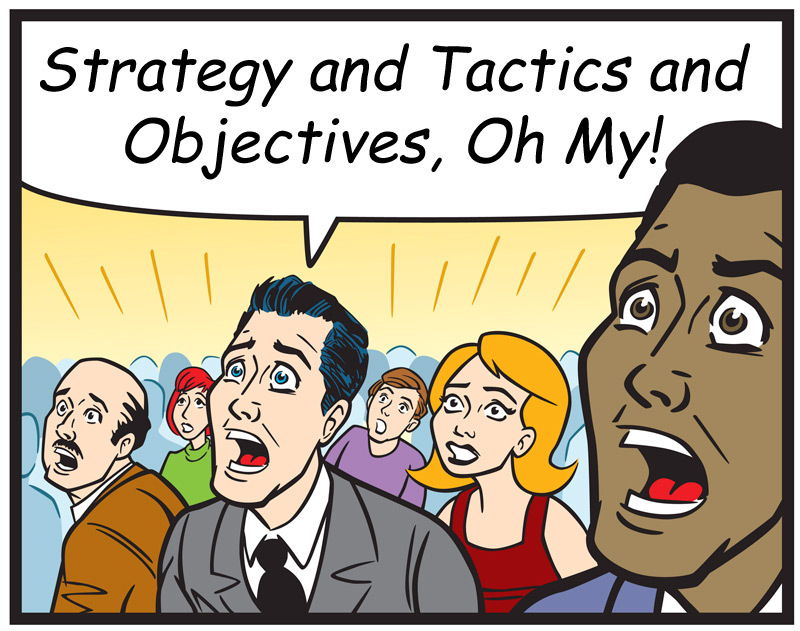 Strategy and Tactics and Objectives, Oh My! | ASTRALCOM - Content Strategy, Conversion Marketing and Customer Acquisition. Strategy and Tactics and Objectives, Oh My! It’s nothing to be frightened of. Yet, I often hear from clients how they don’t truly understand the difference between a strategy and a tactic, or between a goal and an objective. This is such a critical part of marketing and business development success, that it’s worth ensuring we fully understand the differences between these four words. So, let’s start by defining them in our diction. Strategy: the process of planning and implementing a series of coordinated actions in order to achieve a primary goal. Tactic: a specific action or method used to reach a particular milestone or result. Objective: an intermediate target, or step in the process of attaining a goal. In a way, strategies and tactics are similar because they tend to be contingent upon each other. Here is how we look at it: A strategy is carried out with tactics. Objectives are milestones on the way to a goal. Another way to look at it is that typically, a strategy employs tactics and a goal is comprised of objectives. Let’s use strategies and tactics and objectives and goals to plan our family vacation, just for fun. The family has decided to go to Happyopolis (goal). But since that’s quite a distance from where we live, we’ll need to break the journey into a few stops (objectives) along the way. Then, we’ll need to figure out how we’re going to get there (strategy), what we’re going to do during the journey and after we arrive (tactics). Tactics and objectives can be used on their own, but without a larger plan, or end-game, it’s difficult to gauge their real value. However, when tied together goals and objectives help define the target, and strategies and tactics are how the target is hit. Certainly, there is a lot more to this subject than we’ve covered here and we will revisit this topic in upcoming posts. In the meantime, what experiences can you share about strategies and tactics and goals and objectives? Your Name in Lights – in Times Square? Yes, We Can Do That!